A Little About a Lot: We're only little - and our time is short! We're only little - and our time is short! 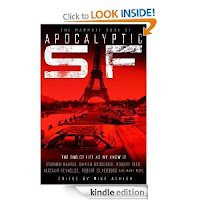 I came up with the title as a tweet when I finished a book of apocalyptic, end-of-the-world short science fiction stories on my #kindle. @dougshaw picked it up and tweeted favourably on my turn of phrase - and that got me thinking more deeply. Why had I enjoyed this apparently depressing set of stories so much? And what had triggered my apparently eloquent phraseology? For someone who's always worked in and thrived on communication and people related activities, I've always held fairly negative views about the human race and its long-term future. We seem to have a built-in self-destruct driver, which historically has lead us into war, famine and ecological melt-down and I think our time is nearly up - maybe not immediately, but it's coming. So reading that collection of short stories satisfied my sense of righteous schadenfreude - we're gonna get what we deserve! So, you see, we're not so big and we're not that clever. We're only little - and our time is short! PS: I actually think that there is much to love about us humans; that we can do remarkable things and show astonishing creativity, compassion, generosity, mindfulness and tenacity. That's why I'm in Learning and Development. It's gotta be worth trying to delay the inevitable as long as possible. Hi Niall - thanks for the mention. Personally I believe I'm in a race to the grave, it's a headlong flight to embrace the inevitable so what can you fit in and do and experience before the lid slams shut :) We are indeed little and our time is short, embrace it. Totally agree Doug! Holidays very soon!! So long and thanks for all the tweets! Hmm... what do I tell my kids Niall? "Sorry about the mess; you don't mind clearing up, do you?" There's hope in my final PS tho' David. Maybe there is a 'wake up and smell the end of the world', Star Trek-type realisation after which humanity sees the error of its ways and reforms itself for the universal good of all. There's lots of good Sci-Fi which rejects the dystopian long view and looks to a much more enlightened and hopeful future. Maybe that'll be the inspiration for the remainder of our generation and the generations who follow us to work to create Utopia here on earth instead. The question is are we delaying the inevitable or building an enlightened and hopeful future? Funny how that is a great way to describe many folk isn't it?!?! I firmly believe we are going through an evolution, more and more people are awakening to the fact that we no longer can rely on just politics and economics to drive humanity, these have been tried and an over emphasis on either does not work, we need to balance these with cultural development. Reflect these also on mind / body / spirit - an over emphasis on one over the others leaves a severely unbalanced individual , giving us the world we see today .... People lining only in their body and some in their mind, in a word dominated by economics and politics.